MEET OUR 2019 CHAMPION, GABRIEL! Children’s Hospital of Pittsburgh Foundation is excited to announce our Children’s Miracle Network 2019 Patient Champion, Gabriel! The youngest of five siblings, Gabriel is always able to make his siblings, friends, and family laugh. Seeing his kind smile, no one would ever guess that he went through rounds of daily chemotherapy and weeks of hospital stays for years to battle cancer — all before his seventh birthday. Given Gabriel’s history of seizures, his family was quick to take him to the pediatrician when he became short of breath after his last swimming class before their planned vacation. A chest X-ray revealed a large mass in his chest and fluid around his lung, and Gabriel was diagnosed with T-cell lymphoblastic lymphoma. 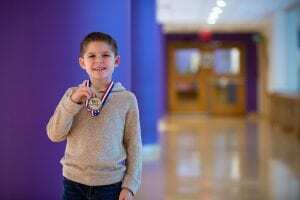 While his siblings and extended family went on vacation, Gabriel’s parents Susan and Bryan stayed with him to begin what would be several years of treatment at UPMC Children’s Hospital of Pittsburgh. It was a long journey for Gabriel as he spent the first 13 months after his diagnosis receiving a combination of daily oral chemotherapy and IV chemotherapy as well as facing unexpected obstacles like a blood clot that required additional shots of blood thinner for six months. Gabriel’s family remained a source of constant support with his grandmothers taking shifts flying across the country to help and his identical twin brother Wyatt teaching Gabriel the lessons he was missing in school, accompanying him to chemotherapy appointments, and comforting him when he was upset. Even while undergoing his own treatment, Gabriel never hesitated to spread his warmth to fellow patients. Gabriel finished his chemotherapy two days after Thanksgiving in November 2017. Now in second grade, 7-year-old Gabriel is an excellent student who enjoys swimming and playing soccer.